Only ideal for attacking players, no real-life players or teams, mini-games feel too "mini"
An addictive simulation for any wannabe footballers who wish to live vicariously through their virtual alter egos. Read about how we complete our reviews. You can check out the review process here, and then you can scope out the scoring guidelines and scoring rubric. 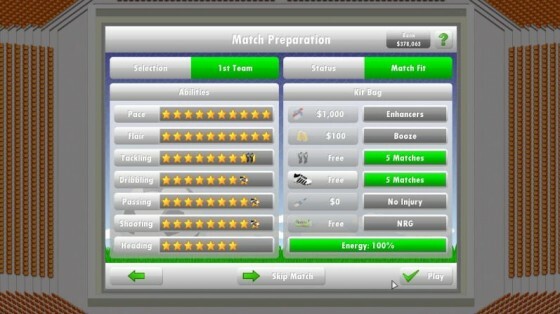 New Star Soccer 5 (NSS5) is a downloadable soccer game that simulates the life of a soccer player. Matches are presented in a top down, 2-D view. The user controls a single player with either a one or three button control scheme. 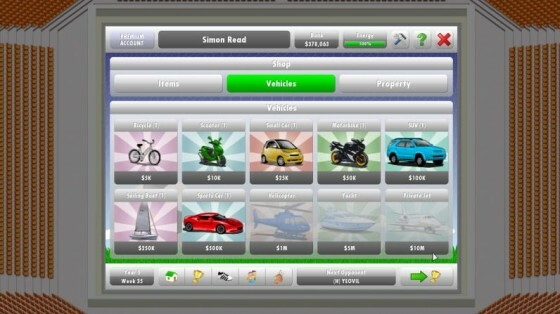 And the graphics, well, they’re exactly what you would expect from an indie, downloadable game. Sounds simplistic? Sure. But here’s the thing. I can't stop playing it. Make no mistake, NSS5 is created with offense in mind. On the field, the action definitely skews towards the arcade side of things. Even when set to slow, the game pace is fast and furious. Besides different formations and abilities, there are generally no noticeable differences in strategy between teams, and all of them are geared to push the ball up field. While there is a fair amount of hoofing and chasing -- NSS5’s creator Simon Read, after all, is British -- the (fake) players are surprisingly intelligent. Your teammates will look to come close and offer support, or make a clever run behind the defense when appropriate; and when they have the ball, more often than not they pick out a good pass. The drawback of this “all attack, all the time” style is that you can really only get the most out of this game by playing as a striker. In a way, these teams are the antithesis of Barcelona, where they sacrifice possession gambling for a goal. This means it’s just as difficult playing as a midfield player because the AI is geared to pass forward. Once the action is ahead of you, very rarely will you be able to catch up with it unless you are chasing for a loose ball. But don’t let this discourage you, because boy, is it ever fun hanging off the shoulder of the last defender poaching for goals. If you keep in mind that the on-field action is not trying to replicate every nuance of the game, but rather amplify the exciting parts of it, you will have many, many enjoyable hours trying to put the ball in the back of the net. Off the field, it’s a mixture of mini-games and RPG elements. The key is to balance your player’s time and energy by maintaining his relationships and skills. Every action you take will consume energy and contain different rewards. Training will potentially improve your technique, depending on how your player fares in the drills. Improving relationships is done in the form of mini-games (emphasis on the mini, as they take literally five seconds to complete) that, if won, will give you a nice boost. Your on-field performance also affects your relationships. Play poorly and the manager will bench you, the fans will dislike you, and eventually, boo your every touch. Commercially, your player gains money by earning wages with the team -- you can always request a transfer if you feel unhappy -- and as your reputation grows you can sign sponsorship contracts. With the money, you can purchase various items, small or big ticket, most of which will boost your off-field relationships or on-field performance. Even if the off-field offerings are slightly basic, they still do a good job adding to the feeling of being a professional footballer. They also give the game a boost in longevity, because, well, who doesn’t want to eventually make enough money to buy a few race horses and a private island? NSS5 is colorful, funky, and in parts of the game, positively cheeky. It certainly helps to approach the game with a good sense of humor. After all, when the promo trailer is like this, you know the game is not trying to hide the fact that it’s not FIFA. In fact, with its top down, 2-D presentation, it very much resembles an early '90s soccer game. You know, the ones where the ball gets considerably larger the higher it is in the air. But of course, you won’t be buying this game based on its graphics -- if nothing else, the kitsch adds to the charm of the overall game. The goal of NSS5 is to achieve superstar status with your player. Win as many trophies as you can with your club and country, sign sponsorship deals as your fame grows, and accomplish all the tasks the game has set out for you. There is also an online leaderboard if you’re that competitive. Although you can replay the game as many times as you want, once you’ve gotten to the top, there’s very little incentive to start again, especially considering that every team plays the same style of football. But getting there will take time, and it’s a hell of a lot of fun getting there. New Star Soccer 5 is just plain fun. It’s a game where you pick up and play it without thinking too much. You start the game, jump right into action and quit whenever you want. However, that might be a little hard to do because NSS5 provides that “just one more turn” feeling that very few games contain. It’s when you think you’re going to press quit, but instead convince yourself that another five or seven minutes won’t be a big deal, and before you know it it’s the middle of the night, and you’ve lost a good two hours of sleep. The game's price tag, at $20, is pushing the ceiling of the “value gaming” category, but for the entertainment NSS5 provides, it’s worth every dollar. Visuals: It’s no FIFA, but the visual elements are just good enough for you to play the game without ruining your experience. Audio: There's not much here, but there a few different chants, and several sound effects for matches and mini-games. Control Scheme: An option of a one or three button control scheme (you can use your game pads, too). Either way, they’re simple, and they work well. Learning Curve: It might take a while, perhaps a season or two, to get your player’s skills up to par with the rest of the league. But after that, you’ll be banging in goals regularly. Lasting Appeal: This is where NSS5 earns its money. The goal of taking your player from an afterthought to a superstar will keep you busy for many hours.